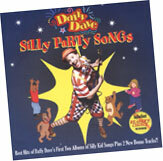 Lyrics from Daffy Dave's clowning, music and storytelling CDs. I love you mommy, can't you see? Why don't you do it for us? We love you kids, you're drivin' us nuts! Don't you know...that singin' is fun!? Can't you feel...that dancing is too? Why don't you sing and...dance with The Dingalings? won't you say hello and sing and dance and play? You live inside our hearts, it's you we're going to miss. 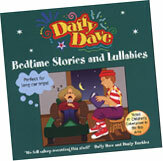 Dave's music graduates to more songs for older children. Even when the teacher says to — sit down! Hey, why did the chicken cross the park? What should you do if you're eaten by an elephant? Run around til you're all pooped out! How much do pirates pay for their ear-rings? And, what do prisoners use to call each other? Why, that would be cell phones. Why is it great to be a test-tube baby? You get a womb with a view. To get the Chinese newspaper. Get it? Get it? ...No? I don't either. I get the New York Times! A big, fat boulder just fell down on my toe! Ouch! that really hurts...want to eat some dirt! Silly Rock 'N Roll is a band-aid on my shirt. Silly Rock 'N Roll don't make no sense to me! I like to mow the grass when I am upside-down. Silly Rock 'N Roll is a cure for the boredom in my soul. Silly Rock 'N Roll don't make no sense to me. Mom and dad stomped down the hall. They were so upset with us, they started to shout!! and that's when I said, "Mom and Dad — time-out!" and then maybe you'll would see the light." She's so cute a silly, but she cries when her bottle gets cold! Well, it's Mr. Lion and he ain't nice! Climb up a tree and don't think twice! If he's hungry, Mr. Monkey, he'll eat you up tonight! 'cause that's the laws of Nature, it sounds mean, but it's o' so true! Animals gotta eat something, just like me and you! look out for that lake! Splash! Swim away right now before it's too late! 'cause monkey's aren't fish swimming in The Nile. Well, I thought he was gone...and that Croc was a jerk! But croc opened wide and gave a great big burp! And out jumped Mr. Monkey and he danced his life away! Well, c'mon everybody and let's do "The Monkey"
Grab your vine and swing high and swing low...whoa! whoa! Yeah, Monkey got away not two but three times! It's Monkey's lucky day in the bright sunshine! Monkey coulda been a meal...he coulda been a big, fat, raw deal! Yeah but Monkey got away 'cause it's Monkey's lucky day. Yeah, Monkey got away 'cause it's Monkey's lucky day. Oh, Monkey got away 'cause it's Monkey's lucky day! and smile at everyone you meet. Ay, us go Talk Story. da less words mo betta fo me. you speak Da Kine funny poetry. you joke around and bust laugh on da beach. you grind all da pupus, which means, "let's eat!" Auntie, Uncle-guys stay coming too. Ho! Get plenty okoles sitting next to me! As what dey call, "broke seat". grab da bamboo poles and Musabi! in ada words, you gotta catch plenty for me! which means...tastes good in my...tummy! us gotta take da Keikis home fo sleep. Ay, no worry! Shoots cuz! Ay, chance 'em..in ada words, hang loose! 2. Red Light, Green Light! 15. 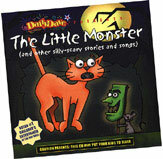 (what Shall We Do With A) Scary Monster? 26. Oh Where, Oh Where Can My Underwear Be? your parents will say "wow"! 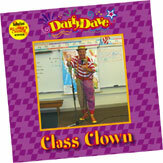 my name is Daffy Dave I'm a real, clean clown. Clap your hands together, everyone say "yay"! Clap your hands together and have a "Daffy Day"! Dance around and sing a song and dust away the blues. and dust your blues away! 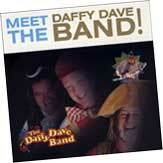 My Name is Daffy Dave and I will show you how to sing a song and clean your room your parents will say "wow"! So, get right down and wipe away your frown my name is Daffy Dave I'm a real, clean clown. But, what does a black light mean? What does a black light mean? Shake your tushie right down to the ground. kick it down the field, trying not to fall. kick it in the net, now we're satisfied. the Soccer Rock – the Soccer Rock 'n Roll! cheering in the bleachers and yelling my name. "Hey, look over there, it's a butterfly!" They scored a goal. They're on a roll. The Soccer Rock – the Soccer Rock 'n Roll. unless you're the goalie, don't you understand? and then you kick again when you hear that whistle sound. I play on a team with a blue uniform, the other team wears a yellow one. We're called "The Sharks" and they're "The dragonflies". When the game's all over, give a big high-five! I scored a goal! I'm on a roll! We scored a goal. We're on a Roll. We may not win, but we're still friends. If we lose, we try again...there's always...next sea..son. Hop! Hop! Hop! Hop! Hop! Hop! Hop! Clap, clap, clap, clap, clap your hands! March in place! March in place! March, march, march, march, march in place! Shake your tushie! Shake your tushie! Shake! Shake! Shake! Shake! Shake your tushie! Tickle your knee! Tickle your knee! Tick, tick, tick, tick, tickle your knee! Dance with a friend! Dance with a friend! Dance, dance, dance, dance, dance with a friend! Shake your feet! Shake your hands! Shake everything all over the place! Jump! Jump! Jump! Jump! Jump! Jump! Jump! Jump! Jump! Jump! Jump! Jump! Jump! C'mon you guys and jump alittle higher! (spoken: "Hey, you jumped thru the ceiling! three four, going out the door! seven eight, over the gate! One two, the cow goes moo! seven eight, oops! too late! One two, now I'm through. three four, want some more? I want to say it all day long just like a crazy bird. Nanny-foof-N-Nanny is swimming in my brain. driving in your bedroom, you'll never get too far! Nanny-foof-n-Nanny is deep inside of you. Nanny-foof-N-Nanny, what's that stinky smell? Someone find a chicken, so I can ring a bell. I really don't, really know WHY! walking on the ceiling your cow can go to bed. Nanny-foof-N-Nanny is the song just right for me. Nanny-foof-N-Nanny is swimming in my brai..ai..ain. wave to the people, All aboard! Everyone stand clear! Climb aboard and hold my hand. Take a trip to Magic Land. Watch the trees and hills go by. Dreams come true for you and I. Conductor says, tickets please! Engineer controls the speed. Rolling down the tracks on time. Engine, engine, number nine! Shake another hand and sing this song. Scratch another back and sing this song. Tickle another knee and sing this song. Give a High Five and sing this song. Bump another rump and sing this song. Give alittle hug and sing this song. Oh Where, Oh Where Can My Underwear Be? Oh where, oh where can it be? Oh bring back my undies to me! Bring back! Bring back! Oh, bring back my (undies) to me, to me! Bring back! Bring back! Oh, bring back my (undies) to me! Oh where, oh where can my dirty sox be? Oh bring back my stinkies to me! Oh where, oh where can my garbage can be? Oh bring back my garbage to me. Oh where, oh where can the bathroom be? Oh hurry, I've got to go. see ya soon, my big baboon. aloha oe, and thanks a lot!